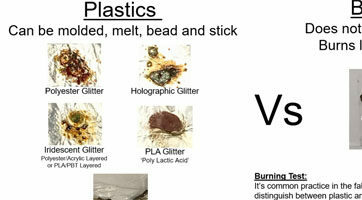 Test if your glitter is a microplastic or mainly based in plastic. This is a VERY BASIC SCREENING TEST to determine if your glitter is microplastic or MAINLY BASED on PLASTIC, such as PET, PVC, PLA or Cellulose Acetate (not biodegradable in natural environments, IE Microplastic). If the glitter melts is mainly based on plastic and is a microplastic. However, this test CANNOT BE USED TO DETERMINE IF a product is 100% PLASTIC FREE or NOT MICROPLASTIC. WARNING: This test WILL NOT DISTINGUISH BETWEEN CELLOPHANE™ (not biodegradable in natural environments) and BIOGLITTER™. To prove a glitter is NOT A Microplastic requires more complex evaluation involving passing environmental biodegradability standards such as ISO14851 Fresh Water Biodegradation, the level of testing we subject our Bioglitter products to. The ‘ECHA Mircroplastic Proposal, Jan 2019’ defines what constitutes a product is a microplastic or not. Always as your supplier to provide scientific proof of biodegradability in the natural environment and that a product is not made from plastic. Don’t be mislead by basic composting biodegradation testing, this is NOT proof that a product will biodegrade in the natural environment. PLA and Cellulose Acetate compost, but, do not biodegrade in the natural environment. Therefore, if PLA or Cellulose are used to make a glitter, the glitter will be a microplastic and environmental pollutant. Heat or burn the glitter product. If it melts and sticks to the surface it’s on, the glitter mainly contains plastic. We find its easiest to put the glitter on a sheet of aluminium foil and heat with a naked flame from beneath.